Courts are unavailable from Mid December through until Mid January due to international tennis events. Please phone Booking line for exact dates. 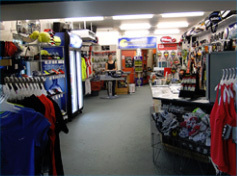 Players Sports is the leading New Zealand stockist of premium tennis apparel, shoes, rackets, balls and accessories. Our experiends staff have a wealth of product knowledge and can guide you in any area of the sport. We provide an excellent, and if required, same day stringing service, expert racket advice, demonstration rackets and a try-before-you-buy service. Click on the Peak Pilates link below for more information regarding the services they offer.